Antiquaires since 1970, siret: fr 24.430113233. 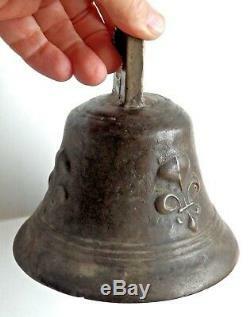 Seventeenth-century bronze bell with lily flowers, astonishing repentance, 17thc antique bell. 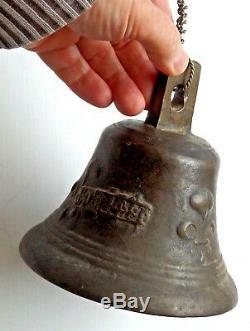 Beautiful big bell, of the seventeenth century, in bronze, well flared adorned with three fleurs-de-lis in a beautiful relief. Fun: the founder used the mold of a patronymic bell he had made for another client, and thought it best to hide his name by a decorated band, still a little gothic. 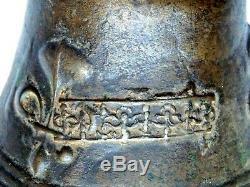 It is a good quality bronze work, unmarked, you will notice the forged wing, quite formidable. Good condition, wrought iron interior hammer, beautiful patina of brass, its a little serious .... our warranty commits us in the following way: we are not experts, but we refund 100%, without questions and with our apologies, any person disappointed by our shipment, within the reasonable period of 15 days. No risk for our customers! The sending of this object 0 for France, and 20 for Europe. 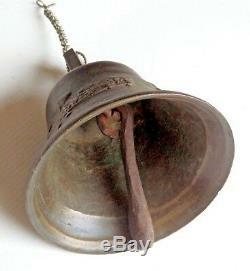 French 17thc antique bronze bell. 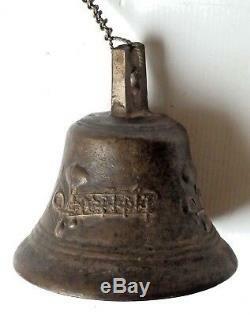 The item "18th century bronze bell with lily flowers, amazing repentance, 17thc antique bell" is on sale since Monday, January 14, 2019. It is in the category "art, antiques, xix and before". The seller is "dany46" and is located in bellegarde, in camargue.